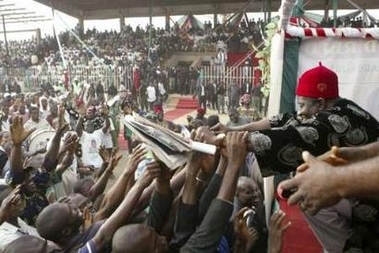 President Goodluck Jonathan has received with shock and sadness, news of the unfortunate loss of some lives due to a stampede at the Port Harcourt Liberation Stadium, during the Flag off of the South South Presidential campaign. The president mourns with the families of the deceased, and prays the almighty to grant repose to their souls. President Jonathan notes with a heavy heart, that these are persons who came to celebrate his success at the primaries of the PDP, and wish him well in the coming elections. "I am sad, and heavily weighed down by this incident. It is sad, unfortunate and regrettable. I mourn with those who mourn tonight. May God grant us all the fortitude to bear this irreparable loss," he said. The president has directed a full scale investigation into the cause of the stampede that led to the unfortunate loss of some lives. May the souls of the departed rest in the bossom of the Lord. The campaing rally caused a lot of traffic gridlock yeaterday. R.I.P to those who lost their lives. I heard today that one of my aunt was among those stampeded to death. Anon February 13, 2011 5:12 PM; so sad. May her soul rest in peace and please be strong. it is a pity. may the soul of the departed rest in peace. gej should take clue, to become president is not by force. dem no get work o jare! @anonymous..am sorry about your loss, may her soul rest in peace.